This is the first play I’ve seen by Henrik Ibsen, who many consider a master second only to Shakespeare, for his influence on modern theatre. But at the time his plays were considered very shocking, and Ghosts was called “a dirty deed done in public,” by one reviewer. Its content may still shock contemporary audiences. Even within the play the “ghosts” of the title refer metaphorically to the looming expectations and precedents placed on a society where everyone tries to do “what is right.” Whatever that means. This abstraction is one that must resonate with anyone whose parents ever gave their opinion on what kind of life their child should have. It also doubles as a metaphor for the result of such thinking: a world of humans going through the motions, dying the slowest of deaths. Under the direction of Morris Panych, Soulpepper’s production is infused with gravity and a conscious observance of Naturalism, the style of theatre of which this play is a prime example. While drama, turmoil and emotional conflicts wring the characters to their wits’ ends, the performances are calm and restrained, as if they are offering each other tea. This seems like an obvious choice for a story which exposes the hypocrisy of conventional society and familial traditions. The story is brilliant. It would be unfair to reveal the ultimate metaphor for what kind of curse heredity can be, but I can tell you it is righteously apt and as cold as ice. It is like Ibsen is saying familial bonds are a mere scientific imposition! And in a way he is quite right. Nancy Palk drinks in the text like a Diet Coke from McDonald’s: crisp and cool, with free refills. Her character, Mrs. Alving, at the centre of this drama, struggles with the idea of what is “right” for her own family, which at this point we know only to be her son Oswald, played by Gregory Prest. But in most cases she cannot see the forest for the trees, just like parents are so apt to do. She expresses the range of emotions from shock and dread to senseless resolve all by barely moving her face. Michelle Monteith sparkles in the thankless role of the young servant whose true identity is gradually revealed to be what 19th century society would consider the lowest of the low. Yet she ends up having the most integrity out of everyone. Diego Matamoros is her crude father, traipsing wet boots through an upper class home. The opening scene shows them sharing a disarmingly “realistically” (styled) dialogue between father and daughter, and every time they appear onstage the rigid deliberations of Palk and Joseph Ziegler – as her confidante and moral arbiter Pastor Manders – are infused with the “life force” that Oswald seems to envy. I feel that this play was appropriately slated for October as the production design gives the whole show the feeling of a haunted house, with deep purples and taupes fragmented by suffocating damask patterns and heavy costumes of black and gray. Fully bare branches scratch the lumbering wall of window panes that are lit to imply the ceaseless rain. I feel this play is a vital work and I am proud of Soulpepper for taking it on. While I know these actors could do the play in their sleep and their timing and pacing is perfectly measured, almost to a fault, I would have liked to see them take a few more risks with their characters. Still, this is an appropriate piece for the season and for a culture which even over one hundred years after Ghosts was written seems to preoccupy itself with appearance, precedent and tradition, and the guise of what society collectively agrees is moral: missing the forest for the trees and the living for the ghosts. 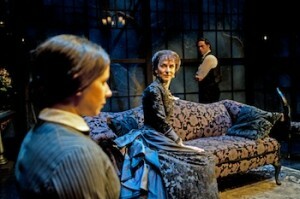 Photo of Michelle Monteith, Nancy Palk & Gregory Prest by Sian Richards.